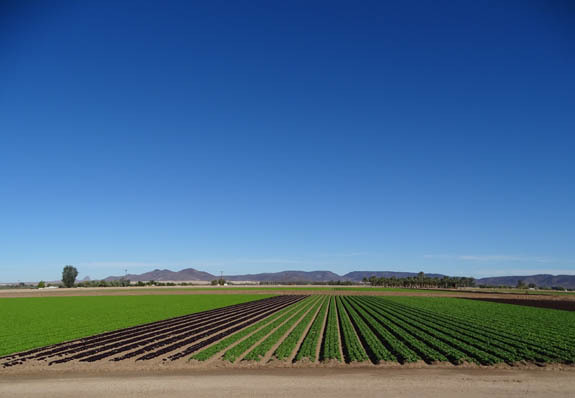 more than 90 percent of the nation's leafy greens from November to March." 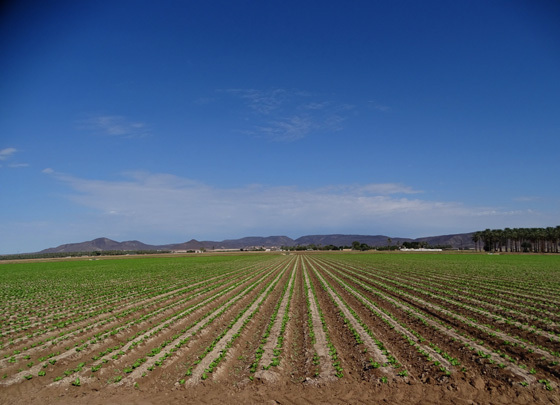 The wide Imperial Valley that straddles the Colorado River north of Yuma in southwestern Arizona and southeastern California is the primary "salad bowl" in the country, producing more than 175 different crops -- including more than 90% of the nation's leafy green vegetables from November through March. To the delight of the numerous human snowbirds who descend on this area from the U.S. and Canada, it's also when we are here and can watch every stage of the planting and harvesting process if we drive or ride our bikes around the little farm roads..
Maybe it's just because I grew up on a farm and still have an avid interest in gardening, but I think driving past all these farms is satisfying even for "city folks" who haven't really thought much about where their fruits and vegetables come from and how labor-intensive the process is, even with some mechanization. 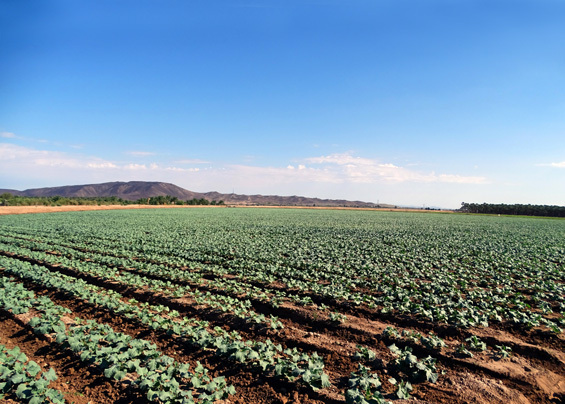 Fragile produce isn't like grain crops that can be mostly mechanically planted and harvested. 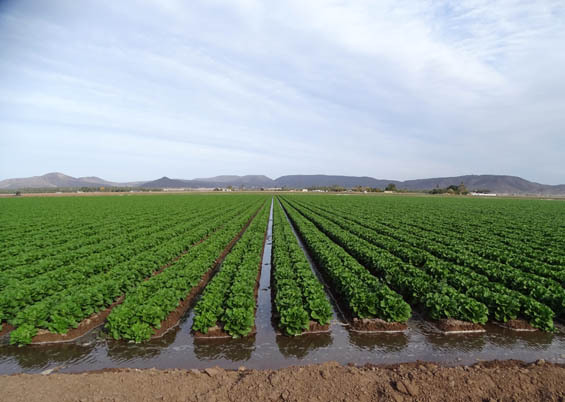 People still have to prep the land, plant the seeds, set up the irrigation systems, prune and thin the seedlings, if necessary, get the weeds out, harvest the crop by hand, pack it appropriately so it isn't ruined, and transport it to market. I find the whole process fascinating, and it's one of the things I like best about spending the winter in the Yuma area. 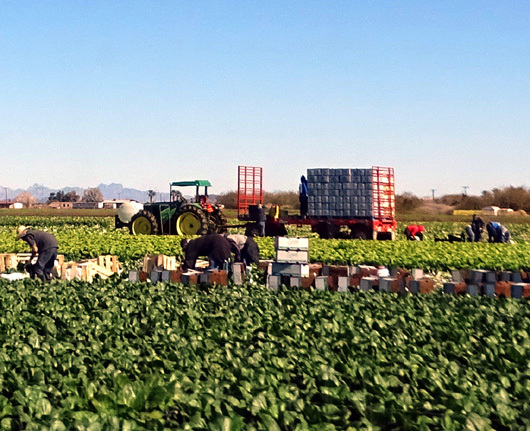 There are large and small farmers' markets, locally-grown produce in restaurants and grocery stores, hands-on farming lessons, "fields to feast" tours at the University of Arizona research farm, the Yuma Medjool Date Festival, and an annual Lettuce Days "feastival" to celebrate the area's homegrown bounty. From our RV park at Yuma Proving Ground there are two main ways to reach Yuma, each about 25 miles to the edge of the city. Most people choose to go the faster way -- east on Imperial Dam Road to US 95 and south on that wider highway to the Foothills on the eastern side of Yuma. It passes a few farms but is mostly desert terrain. We preferred to go west on Imperial Dam Road, across the Colorado River, and zigazg along narrow S24 through California past verdant produce farms and orchards to the western side of the city where more of the stores and medical facilities were located that we used. But the main reason I wanted to go that way was to slowly drive past 20 miles of farms and orchards! Oh, and did I mention that Imperial Date Gardens is on that route? Their date shakes are to die for! We tried to limit ourselves to one medium shake per week but it took a lot of control. The only time I felt totally guilt-free eating one of those things was the day Jim and I both rode our bikes 10 miles to the date store and back. I figured I burned off enough calories in 20 miles to justify the calories. I'll have more about our personal tour of Imperial Date Gardens in a little bit. (the ice cream was in transit to one of the large freezers; dates freeze well, too). When we stayed at the Imperial Dam LTVA four years ago it was in January to mid-March, still in prime growing season but after many of the crops had been planted. 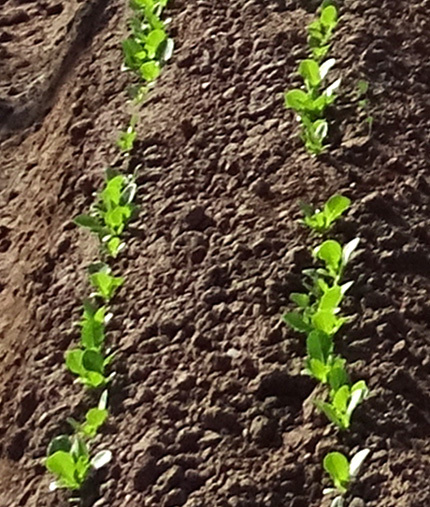 Some greens, like lettuce, grow pretty fast so we did see some turnover in those fields but many like broccoli and cauliflower take longer so we didn't see them when they were seedlings. After the dirt was plowed, trenches and raised rows were made with big farm machinery. Look hard and you can see little rainbows in the spray. 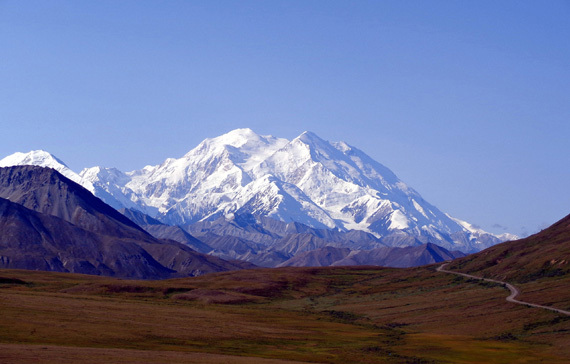 This area gets a mere 3 to 3� inches of rain per year. Per year, not per rainfall like some places we've lived and visited. 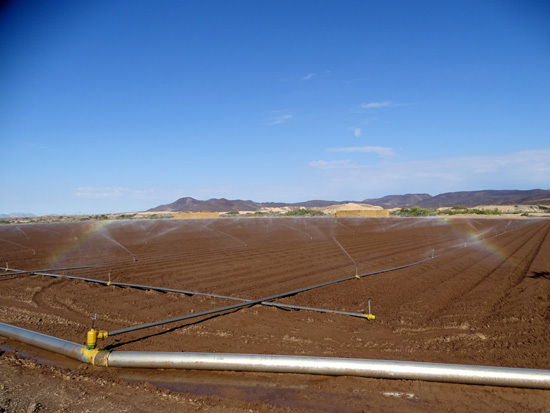 So irrigation is a necessity for the thirsty plants and fruit trees that grow in the Imperial Valley. Other than scant rainfall the only source of water in this region is the lower Colorado River that separates California and Arizona here. I mentioned in the last entry that the last free-flowing part of the river is through the Imperial National Wildlife Refuge. 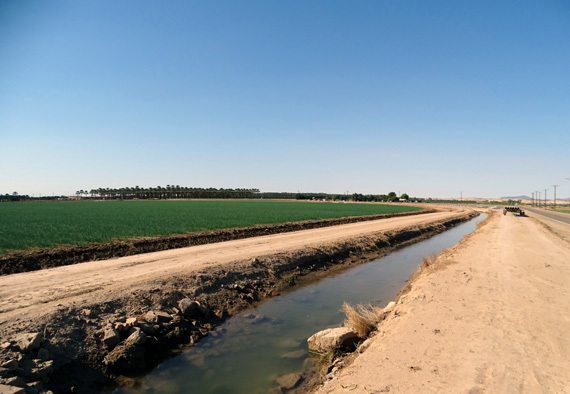 In the next (approximate) 20 miles of the river before it reaches Yuma, a tremendous amount of the water is siphoned off in canals and smaller irrigation ditches like the one in the photo above to hundreds of thousands of acres of farm land. It's a wonder any water ever reaches Yuma -- and I'm guessing there are some serious water rights issues in this area for such a scarce resource. It was fun to watch the young seedlings get larger and larger, then finally harvested. We passed so many fields on S24, however, that it was sometimes hard to keep track of what was where. bright sunshine and heat, as long as they get adequate water. One of the things I miss while not having a house is gardening so it's fun to watch all this agricultural activity going on. 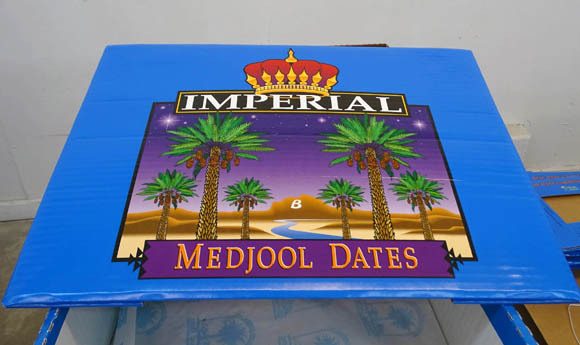 MEDJOOL DATES: "THE FOOD OF KINGS"
Yuma's booming Medjool date production -- up to 10 million pounds a year -- rivals that of the Middle East where they originated. This crop alone is worth about $35 million to the local economy. Dates are a nutritious super-food. They are fat-free and high in fiber, potassium and anti-oxidants. Despite their rich taste they have a low glycemic level. I used to eat them during long training runs and ultra marathons for a quick boost of energy. They can be eaten alone or used in many recipes. 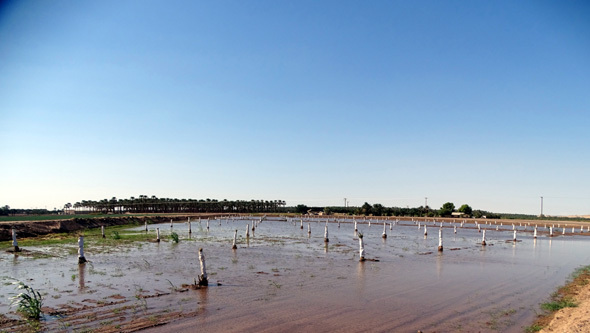 We can see groves of date trees all along S24 on our way to Yuma, from these newly-planted and wrapped sprigs standing in water . . .
More often when we drove by date groves the ground was dry. They just need their feet wet periodically. 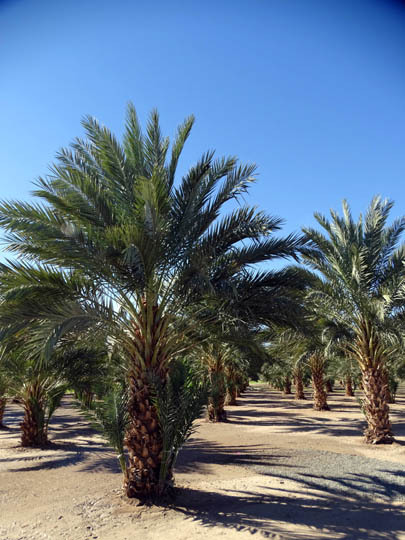 We learned more about the nutritional value of dates, how they are grown and harvested, and the history of how this species came to be grown here during a very interesting free tour we took at Imperial Date Gardens one day in mid-November. During several visits to this date store for their awesome date shakes I saw their sign advertising free date tours during November to March on Wednesday mornings at 10:30. Jim and I showed up on one of the first tours of the season, knowing they would be busier as more and more snowbirds arrived. To our surprise, we were the only ones on the tour that day but our tour guide, Raoul, was most accommodating and gave a great tour. 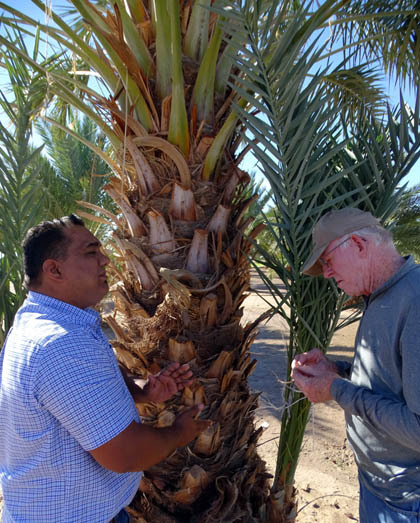 We had the opportunity to ask a gazillion questions as he showed us many of the steps involved in growing Medjool date trees and harvesting/processing the dates. Older date trees can grow quite tall in this ideal climate. 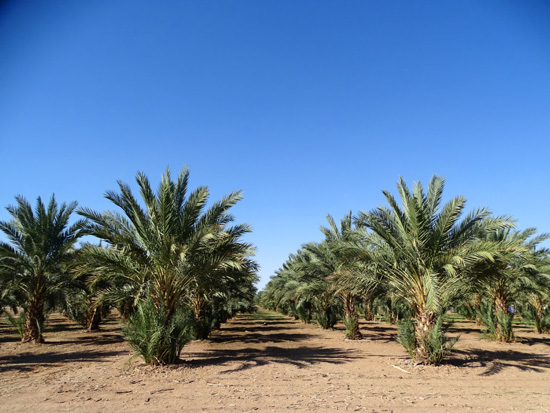 The history of how dates were introduced to Imperial Valley is interesting. Some disease about destroyed the Medjool dates in Morocco back in the 1940s, I think it was. 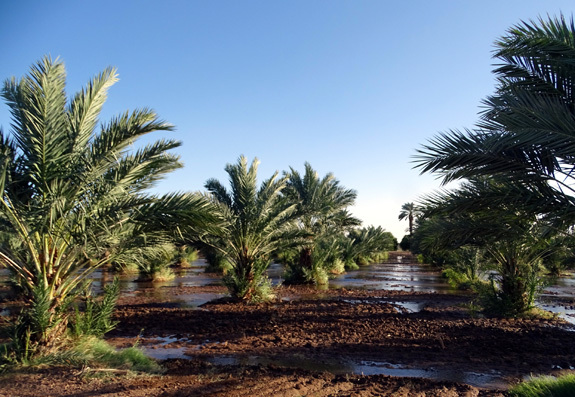 The father of the current owner of this company got 11 good female starts and male trees to pollinate them and propagated them so well that this area produces the most Medjool dates of any place in the world, even the Middle East. Raoul has been working as a bookkeeper for the company quite a few years. He has a bunch of other responsibilities, too, like employee training and conducting tours during the winter. He seems well-versed in every aspect of the business. 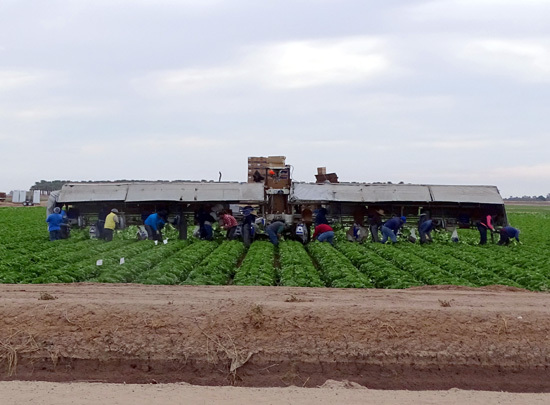 Unlike many of the local farm workers who live across the border in Mexico (just a few miles south of Yuma) and just come here during the day for their jobs, Raoul is an American citizen, born and raised here. He has dual citizenship and recently began living in Algadones, MX. He drives up here every day, which means going through customs 2x/day, and his kids go to school here. Although he pays U.S. income taxes he says it's still much cheaper to work here and live down there. Raoul began our tour outside in the grove of 12-year-old trees next to the large building housing the warehouse and store on CA S24. 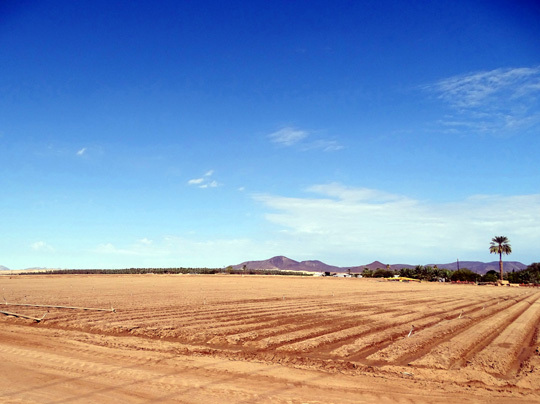 There are several companies involved with the date association in the Yuma area (Imperial Valley). Imperial Date Gardens is the largest and oldest of the group, with 3,100 acres of trees nearby in Arizona and California. The store/processing plant is on the California side of the Colorado River (state border) but most of the trees are on the Arizona side. About 25 trees grow on each acre. Their oldest trees were planted in 1972. Raoul showed us how the female trees are trimmed, de-thorned, and pollinated (in January, which we could see when we were driving by). After the dates start growing in the spring only the best looking 10% are allowed to mature. 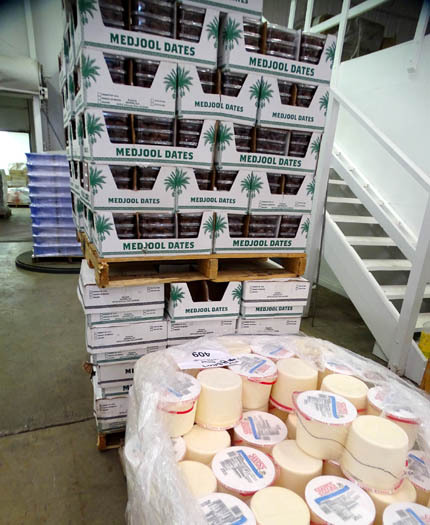 Last year this one company processed over 8 million pounds of dates, ranging in quality from "mixed" to the best. Harvesting and processing the dates is as labor-intensive as doing all the maintenance necessary on the trees. The harvest peaks in August and processing peaks in September, when 500+ employees are kept busy at this one company alone (many fewer work there in the winter). Raoul showed us the processing plant behind the store for the dates that Imperial Gardens keeps; over half their crop goes to the association downtown. 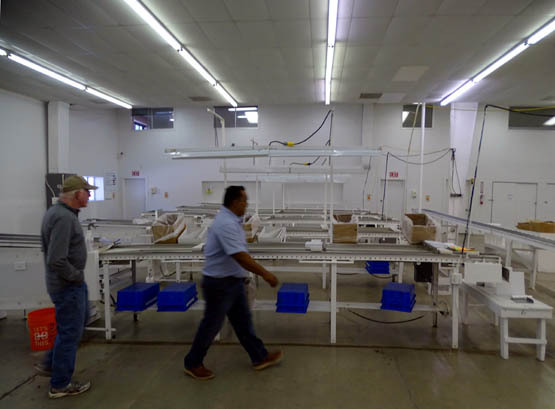 In addition to sorting the dates according to size and quality, they are cleaned, packed, and most are frozen to retain their moisture and flavor. They can be frozen and re-frozen with no problem. Dried dates can also be re-hydrated with little to no loss in quality. The rest of the winter we encouraged other RVers at Yuma Proving Ground to do the tour if they hadn't already. Raoul has the largest groups in January and February when more people are in the Yuma area and tour buses stop by.